Mummy, Daddy and I were really upset when we found out that 4 out of every 5 tomatoes that we eat in the UK are imported from other countries. 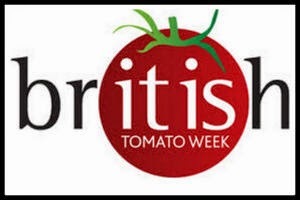 May 18th-24th is British Tomato Week so I'm going to try to persuade you to have a go at growing your own (or at least eating British) this year. Tomatoes are the most widely grown 'vegetable' (ok, you and I both know they're a fruit) in the world. They are grown from as far North as Iceland and as far South as the Falkland Islands. Some have even been grown in space. But British tomatoes taste best as they can be harvested when riper with less distance to travel to reach our tummies. They can be in the shops within 24 hours of harvest. Science boffins have just found out that the colour of light the tomatoes are grown in makes tomatoes taste differently and can vary the amount of vitamins they contain. 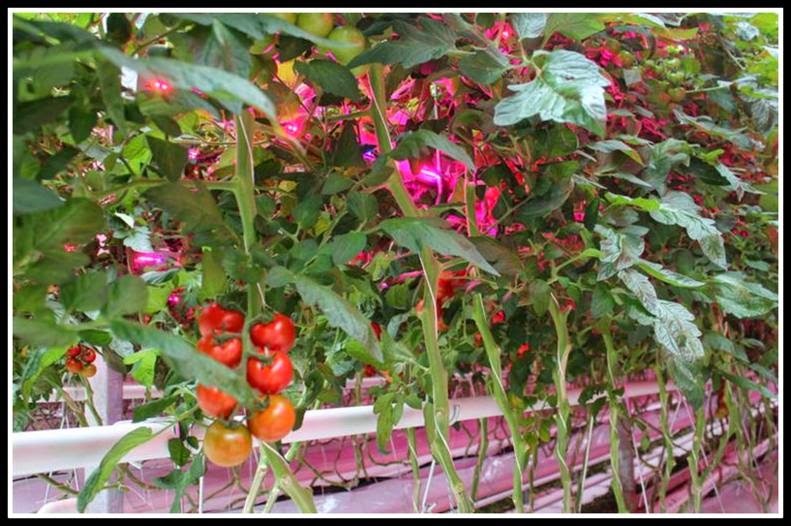 The energy efficient LED lights cost less so UK farmers will be able to compete with cheaper imported tomatoes. The first ever British Winter tomato crops were harvested in December 2014. The time to reach tummy is even less if you grown your own. Tomato seeds are normally sown between February and April. Don't worry if you've not sown any seed, you're not too late to grow tomatoes this year as as you can easily pick up some small plants at garden centres or specialist tomato selling websites. For expert tips on growing tomatoes from seed (for next year) and making yummy chutney read my Tasty Tomato blog. Despite the biggest UK tomatoes greenhouse being the size if 25 football pitches (!! 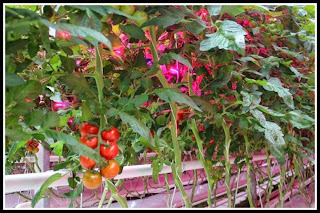 ), you don't need much space to grown your own. Just pick types that will happily grow in pots or even a hanging basket. Sunlight rather than heat is the thing that make for best tomatoes. If its too hot the plants produce less fruit and they don't taste as good or last as long. Let's hope we get a sunny Summer then! Is this small plant really going to produce tomatoes AND potatoes?! By growing your own you can get a really big range of colours, sizes and flavours. 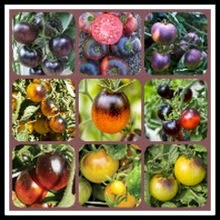 Euan is growing black tomatoes this year but I never knew you can get pink, white and even indigo blue tomatoes. If your garden does suffer from blight you can pick certain varieties such as Ferline, Legend and Losetto that are more resistant to the disease. But they can still catch it in warm, wet weather. Losetto has the bonus of being way to grow in containers in small gardens. The Tomtato that I trialled last year is another solution for small gardens or balconies. I'm going try another one this year too. Sungold is an orange coloured cherry tomato that loads of people think is the sweetest and best tasting of all. Shirley is one of Euan's granddad's favourites and he's been growing tomatoes for 60 years. It is a medium sized tomato that normally gives a good crop. Rambling Redstrip is a great one for hanging baskets and has lovely green stripes on the red tomatoes. It has a long cropping season too. Although they looking nothing alike, tomatoes and potatoes are related to each other (I think they're second cousins once removed or something). 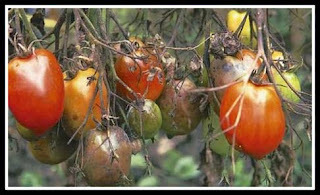 So tomatoes can also suffer from the nasty sounding disease blight. It's caused by a fungus and is normally more of a problem in tomatoes grown outside as the fungus likes damp weather (look out for my blog all about it next month). The brainy folk at the RHS have useful info on their webpages about blight and other tomato diseases such as blossom end rot and cracked or split tomatoes (both can be prevented with regular watering). My favourite way to eat home grown tomatoes is right off the plant when you can still feel the sunshine on their skin, yum. Even in pasta sauces Mummy says they don't need cooking as they are so yummy. She just chops some up with garlic and torn basil and tosses them through pasta with some olive oil. The British Tomato Growers Association website has a super kids friendly tomato zone with games and activities for 5-11 year olds and for 11-16 year olds. Click here to have a look around. 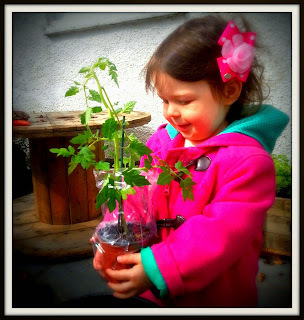 I'm off to check on our little tomato plants to make sure they're got enough water. Make sure you buy British this week. 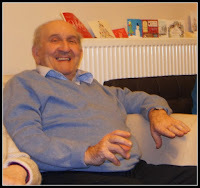 We dedicate this blog to my BFF Euan's grandad Ian Kerr who sadly passed away this week. Ian was a tomato grower extraordinaire and obtained enormous pleasure growing hundreds (yes hundreds) of tomato plants each year to give to friends and family.